Happy second week of February! For those of us in cold places that means that it is a little bit closer to Spring (and warm weather)! I always have had an interest in ad campaigns because I feel like they can be so inspirational. A beautiful ad can give you ideas for outfits, hair, nails and makeup! This is one of my favorite thus far for Spring 2010; the Hermès print ad featuring Karlie Kloss resting on a pile of the company's beautiful scarves. There is also one braided through her hair. So fab! I hope that it inspires you! 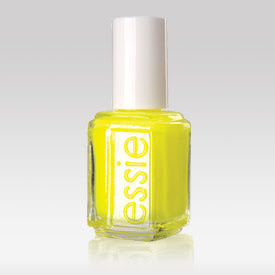 I know that I will be purchasing some orange nail polish in honor of this ad... or maybe this new yellow that I just bought from Essie? I wonder how it looks on your nails... Can you do a swatch? For you, anything ;) I haven't received it yet but I did get a pastel yellow this week from Models Own, so I will try and do a NOTD with it soon!